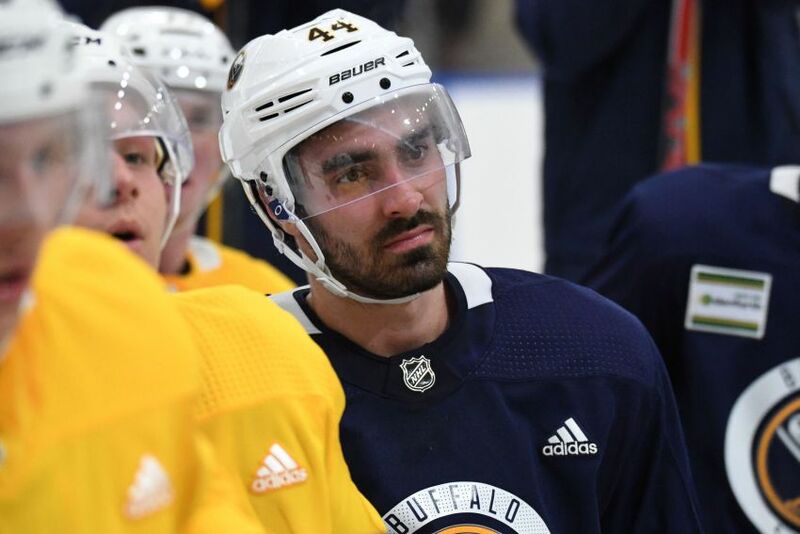 BUFFALO – When Sabres defenseman Brandon Hickey received word he would be playing in tonight’s preseason opener, he said a “whole bunch of anxious energy” started running through his body. Hickey, 22, is a bit old for a rookie. Despite being picked by the Calgary Flames in the third round, 64th overall in 2014, he stayed at Boston University four seasons. So Hickey, who was acquired from the Arizona Coyotes on June 14, is more of a finished product than other youngsters. It makes him an intriguing prospect. Hickey was so highly regarded he earned a coveted spot on Team Canada’s World Junior team in 2016. Given the Sabres’ defense depth, he will likely start the season with the Rochester Americans. Still, Hickey refuses to believe he’s ticketed for the AHL. Hickey signed with the Sabres shortly after the trade. If he wanted, he could’ve waited until mid-August and opted for free agency. But right away, Hickey felt comfortable in Buffalo. The Sabres have three other BU products. Since it’s the first preseason contest, tonight’s lineup in Columbus against the Blue Jackets features plenty of youngsters. Forwards: Patrik Berglund, Kyle Criscuolo, Sean Malone, Alexander Nylander, Andrew Oglevie, Victor Olofsson, Danny O’Regan, Tyler Randell, Evan Rodrigues, Tage Thompson, Scott Wilson. Defenseman: Hickey, Nathan Beaulieu, Taylor Fedun, Brendan Guhle, Casey Nelson, Devante Stephens (a possible scratch) and Matt Tennyson. Goalies: Linus Ullmark and Jonas Johansson. Ullmark will likely start. The Sabres host the Pittsburgh Penguins on Tuesday, so defenseman Rasmus Dahlin, the first overall pick, could make his exhibition debut then. The Sabres will fly to Columbus this afternoon.